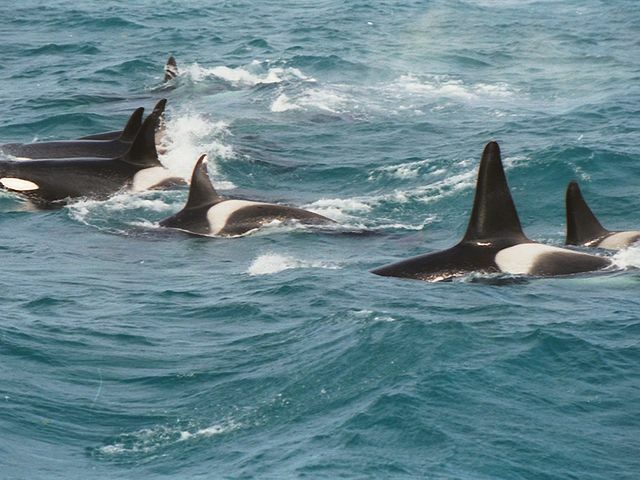 Wild Orcas as they were meant to be, free and hunting in the Norwegian Sea. Yesterday in California, more than a million voices, via their signatures on a petition, were raised up against the continuing captivity of Orcas at Sea World San Diego, but they simply could not compete with those of the owners, the local city Governments, or the faithful lobbyists who work so tirelessly on behalf of their clients. What was at stake was the fate of the Orcas at Sea World facilities and their questionable safety and treatment. Animal rights activists came from everywhere, along with parents, teachers and children to show their support for California Bill AB2140, proposed by Democratic State Assemblyman Richard Bloom of Santa Monica, who was apparently influenced by the highly popular and widely publicized film, Blackfish. It is reported that the Sea World lobbyist is Scott Wetch. Naomi Rose, who is a marine mammal scientist with the Animal Welfare Institute, sponsored the Bill, AB2140. This Bill would have stopped the killer whale/Orca shows at Sea World in San Diego and phased out their captivity. But at the end of the day, power and money won. Now that the Bill has been sidetracked, or waylaid until mid 2015 in San Diego, all involved in this seem to agree that next on the list, are the Sea World facilities in Florida and Texas. A curious item was mentioned on our local news, that Sea World’s attendance is down , but their profits are up. Usually when a great many people are as enraged as those who signed this petition are/were, something happens, things get changed, but in this case, it appears not, and over a million signatures on this petition meant zero to Californians. Not surprisingly, Sea World did a massive, continuing campaign press blast, to discredit the film Blackfish, while the San Diego Chamber of Commerce declared that Sea World and the Whales are extremely vital to their economy. And, now that this scenario is guaranteed be repeated in Texas and Florida, you can be assured that the Sea World owners, local city Governments, and the lobbyists, will push back even harder with everything that they have, but it will in the end be, mostly about the money. When those with the money and the control do not hear the voices of over a million in protest, we must speak even louder. This entry was posted in Activist, Animal Abuse, Animal Activist, Animal advocates, Animal Issues, Animal Organizations, Animal Rights, Animal welfare, Animals, Blackfish, California, Florida, Lobbyists, Orca Pod, Orcas, San Diego, Sea World, Texas, Whales, Wild Animal, Wildlife Activists, Wildlife Advocates, Wildlife Issues and tagged Animal Abuse, Animal Issues, Animal Rights, Animal welfare, animals, Blackfish, California, Florida, Lobbyists, Orca Pod, Orcas, San Diego, Sea World, Texas, Whales, Wildlife, Wildlife Activists, Wildlife Issues. Bookmark the permalink. It would be so helpful if the media reported on these things, but US mainstream media is owned by the elites and controlled information controls the masses. This, my friend, I believe is our biggest obstacle! Things not seen on TV just don’t exist in the minds of the masses. True journalism would free us very quickly, and we’d evolve much faster. But what can we do about it? Ssshooouting from the top of my lungs! Thank you for your excellent post. It should be a wake-up call to ordinary citizens when they see that those in power don’t care what they think and will continue regardless with whatever is profitable to them. If we collectively let this slide where will it end? Thank you so much! Better yet, what if we collectively fight this and them to the bitter end? Shout louder and don’t stop shouting! I can’t believe this!!! Too many “big interests”. Who cares? Screw the animal …. they are here for human use and profit! Oh, yeah!! SMH …. argh!! Go get ’em Dr. Rex!! I will!! At least try!! I have complete faith in your zeal and strength! I support you in you animal rights efforts. But I also wonder if facilities like these(at the expense of captives) create an awareness and appreciation for sea life. Trips from elementary and middle schools to Miami Sea Aquarium a must for decades. In California and other states, many children get to see wildlife in their natural habitats. I would much prefer that to the lifelong misery of captivity. What will work? A ballot initiative? What ever it takes, we must respond and never back down from the rich owners and lobbyists. Come on, everyone!!! Together we can make this stop. Together we can save lives. Thank you so much for your help on this vital issue! It is quite valuable information. You are welcome. Whale and Dolphin Conservation is a cause I follow so I am happy to pass on information that comes my way. I’m a passionate supporter of SeaWorld and all they do for conservation. P.S. It’s not that “money and power” won, it’s that the number of SeaWorld supporters numbered more than SeaWorld’s detractors, and we spoke out just as loudly, if not louder. We are in complete disagreement on this issue. I do not like to have to say these things, but felt compelled to defend the post and those who agree with it. A lot of people only know the SeaWorld propaganda and the truth must be spoken. Perhaps it will inspire others to look a little deeper into the workings of this cruel company that pretends it does good things, (in order to make a buck or a billion). I appreciate your strength to speak, and yes, I know it can be hard, but it came out right and not confrontational. I truly appreciate your thinking on this. My first Irish/Shawnee knee-jerk reaction was hostile. My feelings about companies and organizations that hold animals hostage for personal or financial gain is very negative. Amen, Sister. Let’s release these great creatures from captivity. I agree that Sea World does good work in conservation. Still, they enslave whales, dolphins, sea lions, and otters. I cannot support that enslavement, even though Sea World does many good things. Let us instead support organizations that assist our brothers and sisters in the animal world without enslaving them. Could not improve on this in any way. Thank you so much. A fascinating interview with an incomparable writer. Thank you for sharing this! we must defend those who are part of our eco system,great blog and a graet initiative! keep up the good work!